As my readers know I believe that fun experiences can be found not only by going far, far away, but often by just opening your eyes in your own backyard. I am also fortunate to live in a city that offers a seeming unending supply of these intriguing points of interest. Blizzard Jonas blanketed our area with 30 inches of snow and all activities except shoveling were curtailed. My tracker posted a 5.2 miles equivalent as I worked for over two hours to free my car – great cardio! 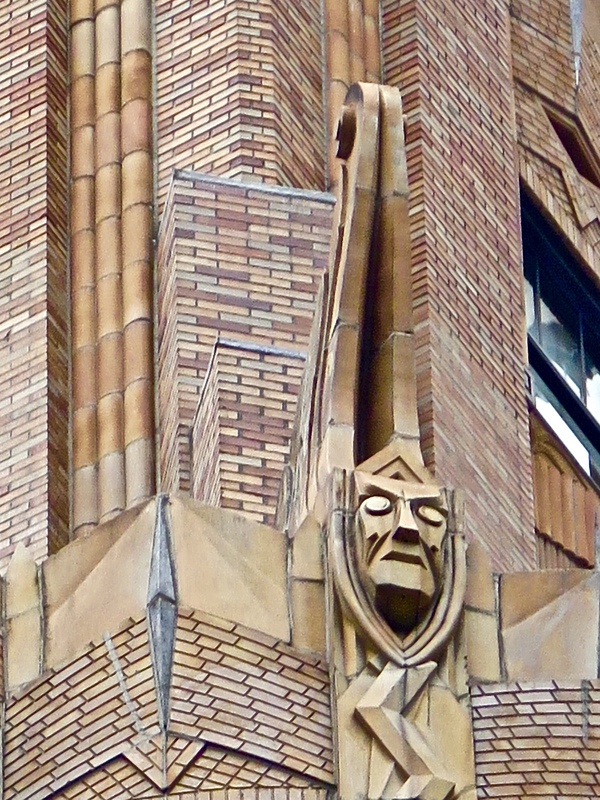 BACKGROUND AND HISTORY OF ART DECO – There are several opinions on the origin of this style, and after some research I think this make the most sense: The term Art Deco was coined during the 1925 Exposition Internationale des Arts Decoratifs Industriels et Modernes, which was held in Paris. 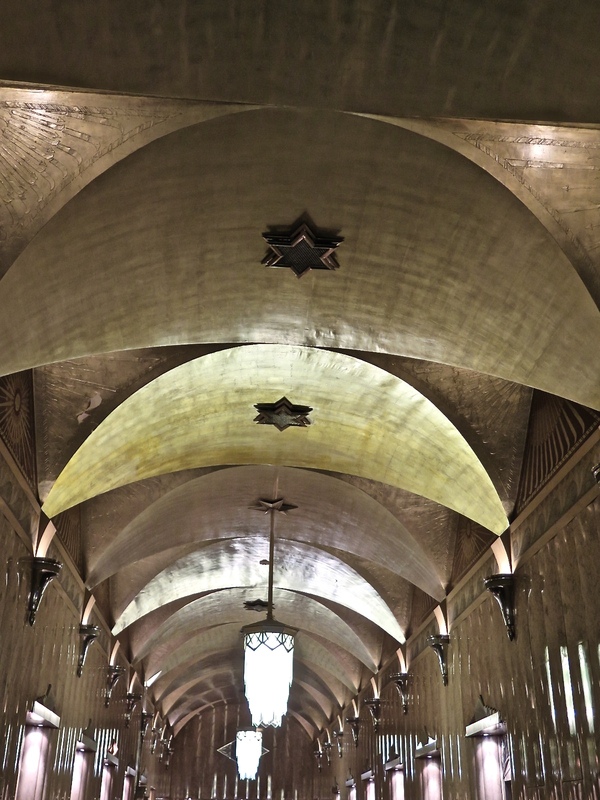 This exposition was organized by a group of French artists known as The Societe des Artistes Decorateurs and some of these artists had been involved with a similar style known as Art Nouveau. 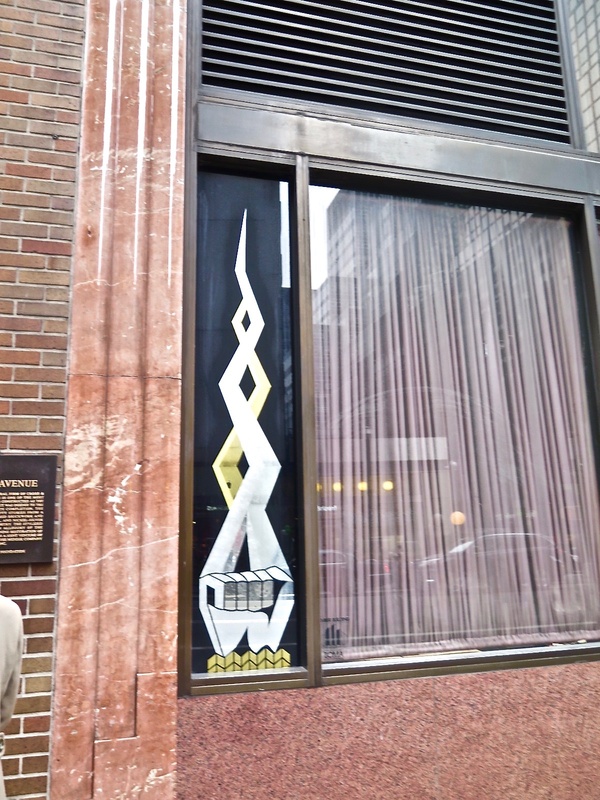 However the term Art Deco was not widely used until the 60’s when a retrospective was mounted. Architects and designers around the world adopted this grand style in force during the “Roaring Twenties” and the Great Depression of the ’30’s, and a major impetus for this was the advancement of building materials, particularly metal alloys that were relatively lightweight and easily workable: aluminum, stainless steel and bronze. 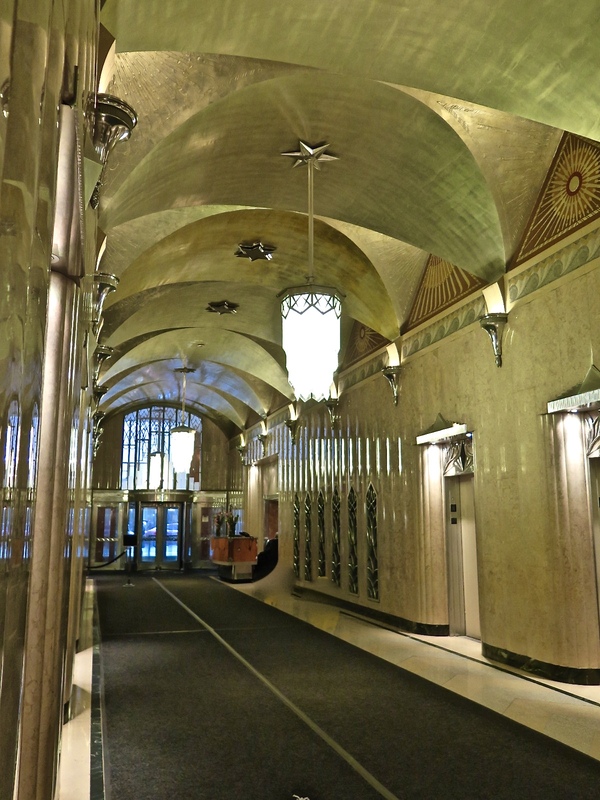 Also, the Art Deco style was not only about shape – color played a big part in both the exteriors and interiors of private and public buildings. 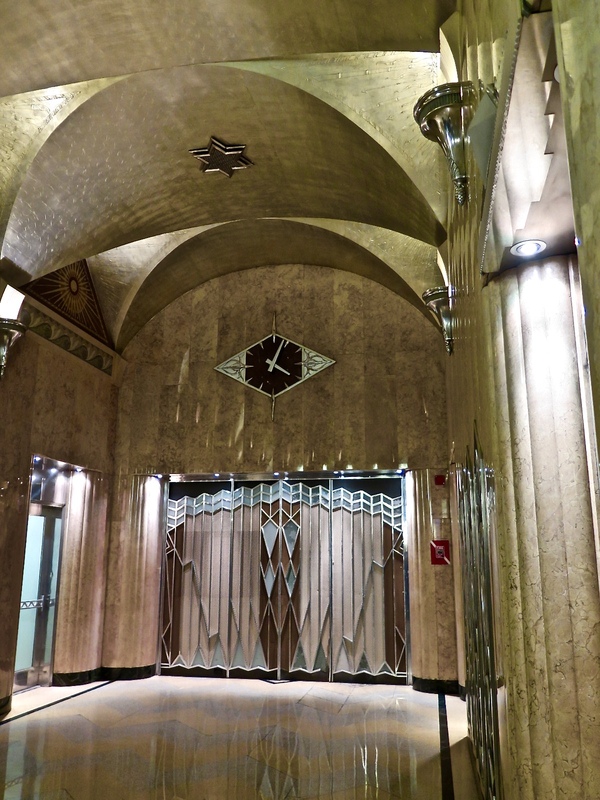 Art Deco was created simply for decorative purposes. Now back to the present to recap this recent city walk. 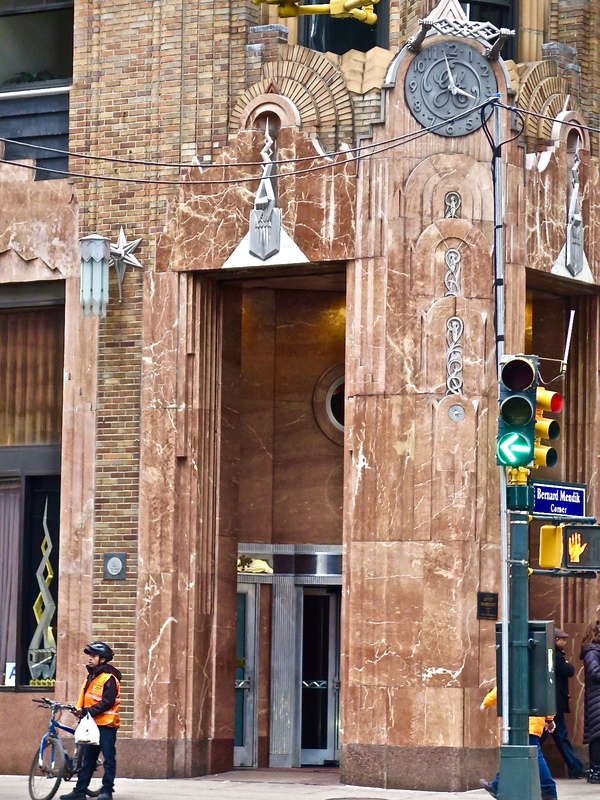 This tour covers well-known Art Deco structures in Manhattan. You might think, why look at buildings that are so familiar? Surprises. And these buildings did not disappoint. We visited 5 addresses but there is so much detail from the history of the construction to the stunning edifices themselves that I am going to break this up into multiple posts. 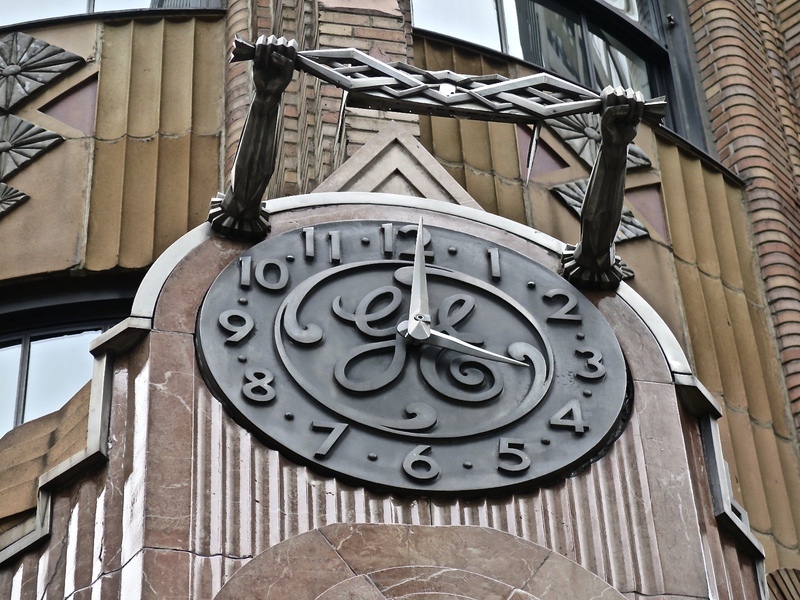 Today’s Designated Landmark selection is the General Electric Building located at 570 Lexington Avenue. Why? 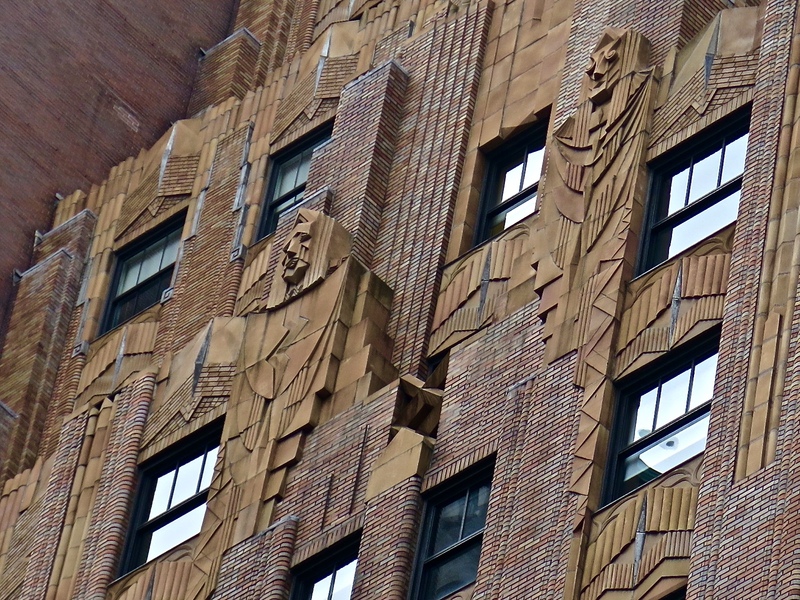 I have passed this building innumerable times and somehow never noticed the staggering beauty. First, a brief history. 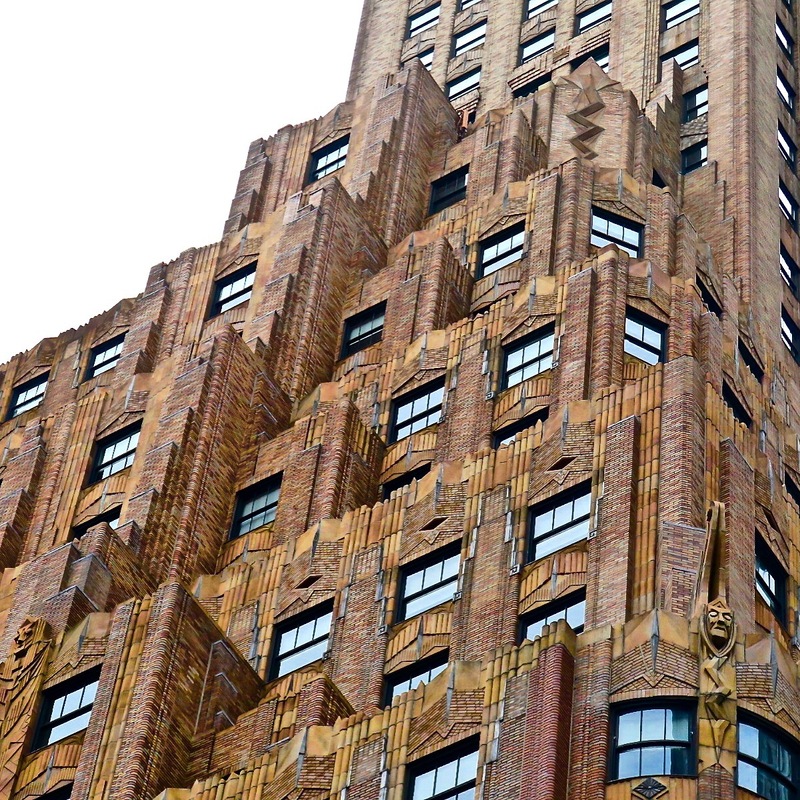 BACKGROUND – The site was originally known as the RCA Victor Building which was being constructed by architect John W. Cross at a time during the early 1930’s known as the Great Skyscraper Competition. While building tall was not new (Pyramids, Eiffel Tower etc) the need to show power and wealth or just to push the limits of what is possible reached a fevered pitch in the 1930’s. In a can-you-top this race the early Manhattan skyscrapers vied to be the tallest. 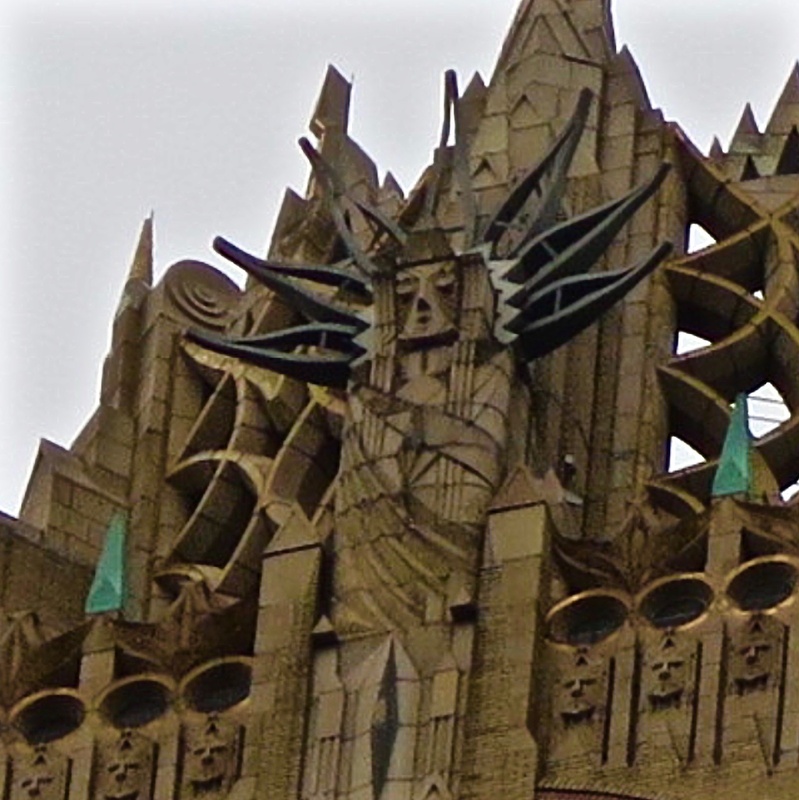 The Woolworth Building (792 feet) held the title 1913-1930 until the ornate Chrysler Building (future post subject!) arose to 1046 feet to wrestle the title away in 1930, only to be bested by the Empire State Building which reached 1250 feet. The ESB managed to keep its crown for over 41 years until 1972 when the World Trade Towers touched the sky at 1368 feet. And so the battle rages on, with title of “World’s Largest Artificial Structure” going to the Burj Khalifa in Dubai, United Arab Emirates (2,722 feet) since 2010. They surely don’t make them like this anymore. 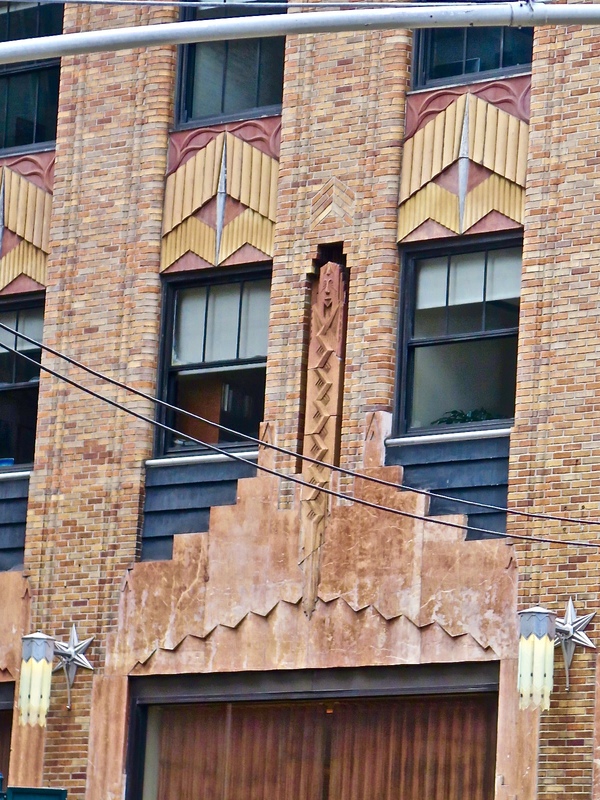 But no worries, there are more spectacular art deco designs to come next week! 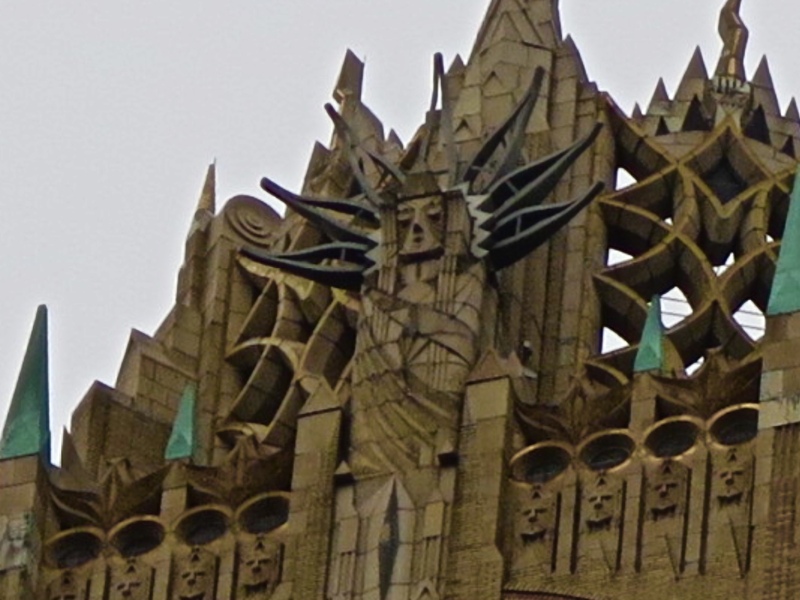 This entry was tagged ART DECO, CHRYSLER BUILDING, GENERAL ELECTRIC BUILDING, GEOMETRICS, LANDMARKS, PYRAMIDS, RCA BUILDING, SKYSCRAPERS, ZIGGURAT. Bookmark the permalink. 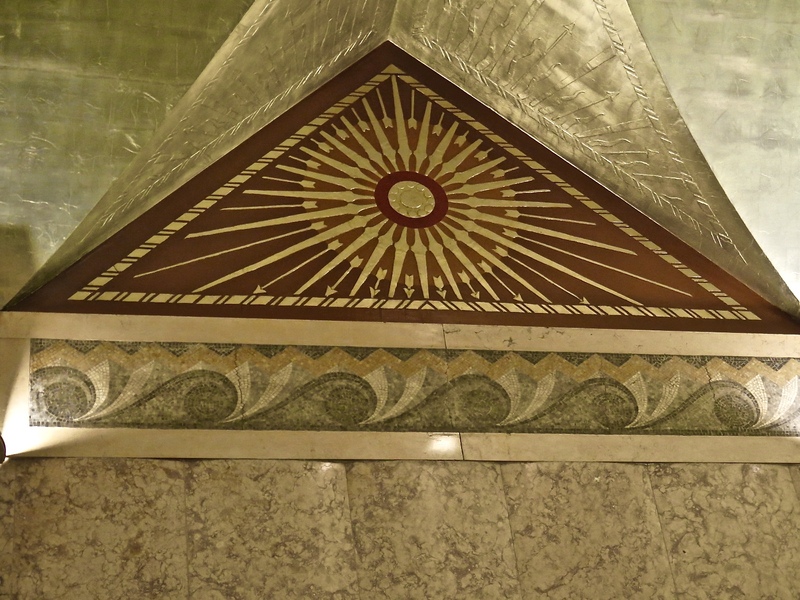 Thanks Ginny- it floored me that I was looking at these designs and symbols for the first time after passing this structure for years and years. Our eyes may be open but we don’t always see!